I’m back! Perhaps temporarily, but I just finished writing a paper and have some time before the dog needs dinner and a walk. Grad school takes up a lot of my time–but only 10 months to go! (Oh yes, I’m counting.) Unfortunately, while I’ve been doing plenty of paper-writing and paper-reading, what I haven’t been doing is drinking a lot of beer. The one I’m writing about today I drank back in May. This is why I keep a notebook. 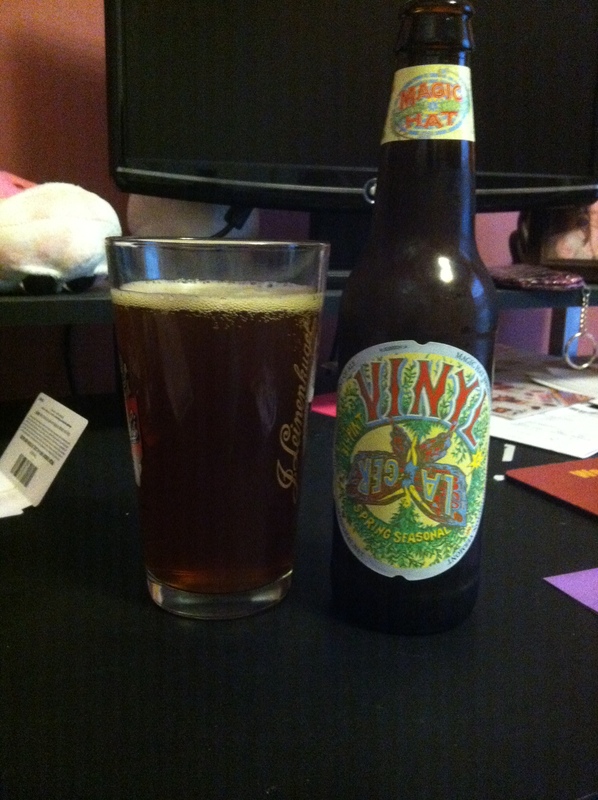 Tonight’s beer of choice is Vinyl by Magic Hat Brewing Company in Burlington, Vermont. Style: American Amber/Red Lager. This is a catch-all sort of category. You’ve got slightly fuller lagers than the American Light lagers (which includes Miller Lite and Bud Light, among others.) These beers have low bitterness and are a bit maltier than their light sisters. Appearance: Gorgeous amber color which unfortunately does not come through in the photograph. I’m working on getting one of those staging thingys. The tan head disappeared quickly after pouring. The beer itself is pretty clear. Aroma: Mostly roasted malts; and you can definitely pick up some caramel notes too. Taste: Malt and hops. This is almost too bitter for a spring seasonal but then again I’m not the biggest fan of very bitter beers. However, the balance between malty flavors and bitter flavors is even. Mouthfeel: Well, this is definitely a lager–you can feel all the carbonation! It is somewhat thin but that’s okay for a spring beer. This would be a decent session brew. Even though it’s probably going to be about 90 degrees today, I’m doing my last summer beer review until probably next April or May. 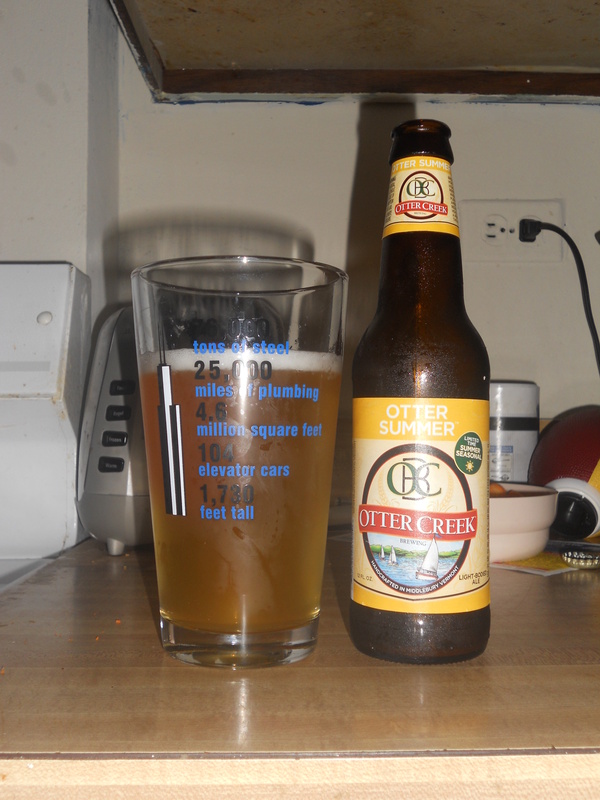 So here we go, with Otter Creek Brewing‘s Otter Summer. Otter Creek Brewing is a Vermont-based brewery (apparently I really like Vermont beer) and by the beer selection on the website, it appears to be pretty small. There are 3 year-round brews and 3-seasonal brews (a Summer, Oktoberfest, and Winter.) I’d like to get my hands on the Oktoberfest, but for now, let’s talk about the Summer! Style: American Wheat Characterized by a light golden color, high carbonation, and moderate bitterness. Not very fruity. Overall Impression: All bite and no bark. Since this is a summer beer, I was expecting a little bit of fruitiness. It would have been a great balance to the otherwise hoppy flavor. Then again, it is pretty true to the style Otter Creek claims they are going for. Appearance: Light golden in color, with easily visible carbonation bubbles. Little to no head retention. Aroma: Mild hoppy scent, not much else to smell here. Taste: Mostly hops. Not overly bitter, but there isn’t much else to taste here. Try this if you like: Sam Adam’s Summer Ale, Bell’s Oberon. And I’m back! Got internet on Friday, took off to Wisconsin for a friend’s wedding for the weekend, and now writing a beer review! Today’s selection is from Vermont’s Long Trail Brewing Company. Blackbeary (yes, that’s spelled correctly) Wheat is an American wheat beer with a hint of blackberry flavor. As you can see, it’s pale gold in color, and is basically clear. 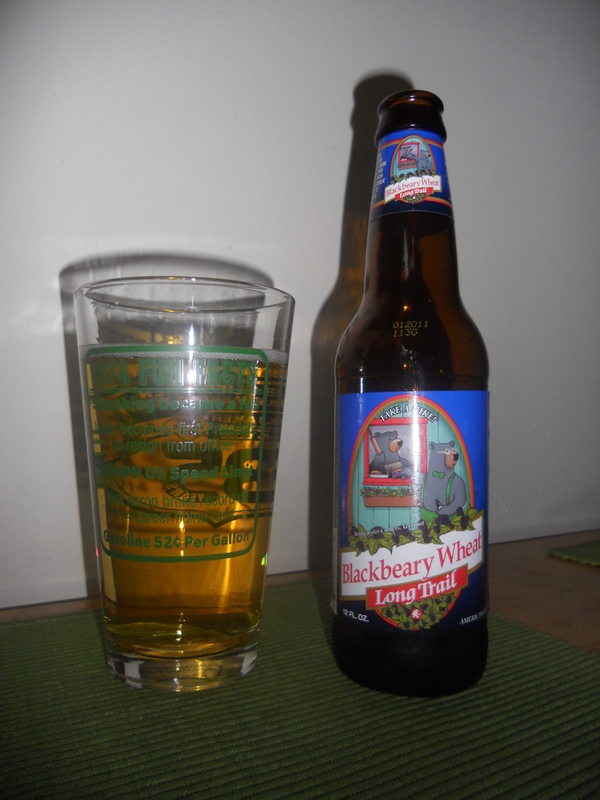 It has a mild blackberry aroma, and a slightly stronger blackberry taste. It’s not very bitter at all–mostly tastes like you squeezed blackberry juice into a typical American wheat beer. Blackbeary Wheat, because it is light and not bitter, is a great thirst-quenching session beer. It went quite well with the baked salmon I was eating along with it, but I wouldn’t eat it with anything that had a very strong flavor. I bet it’s good with tilapia. While this was a decent beer, it wasn’t particularly interesting or memorable, so it only gets a 3-pint rating. Try this if you like: American wheat beers, Ithaca’s Apricot Wheat, or Southern Tier’s Raspberry Wheat. My last “build-your-own-sixpack” adventure to Wegman’s ended with a good selection of summer seasonals, and here’s the first. 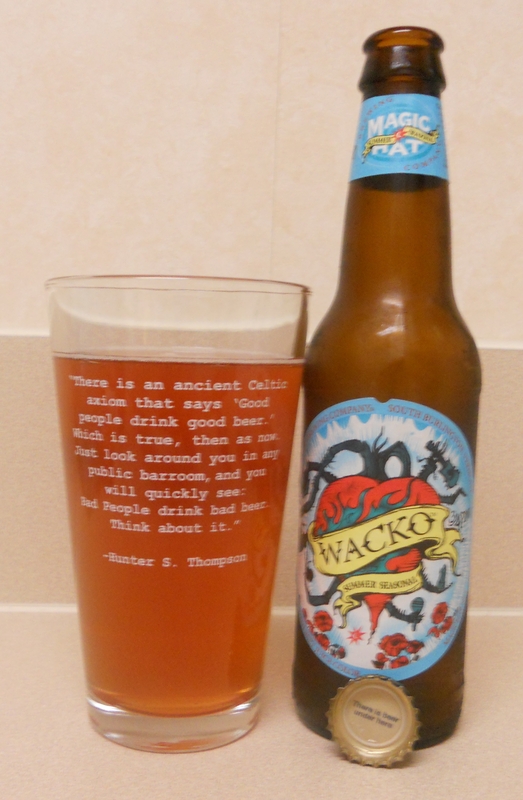 “Wacko”, by Magic Hat Brewing Company, is a very interesting beer. For starters, check out this beautiful red color! Okay, so it looks a little less red here, but let me tell you, when I poured it, I was not expecting it to be the reddish gold hue that I got. The second interesting thing about Wacko is the taste. It is a fruit-hop duet almost in perfect balance. But I could not identify the fruit. Examination of the bottle revealed beet juice as an ingredient, so maybe that’s where the fruit taste came from. Wacko finishes clean, with a crisp taste, and virtually no aftertaste. It was definitely a refreshing thirst-quencher, and isn’t that all you really want out of a summer beer?